Oceanic Systems’ 4161 Multiple Engine Display and the 4166 Dual Engine Display are the primary choice for vessels worldwide due to their ease of configurability and super-sharp graphics. Both models use a simple switch setting to select from a menu of leading inboard or outboard engine manufacturers. The displays also contain a number of unassigned switch positions for future engines to be added. The current inboard choice includes Caterpillar, Cummins, FPT, John Deere, MAN, MTU, Seatek, Volvo and Yanmar while Evinrude, Honda, Mercury, Suzuki, and Yamaha are the outboard choices. The displays also present the selected engine manufacturer’s error codes to fully comply with the engine manufacturer’s warranty. With their advanced functionality and appearance, the Engine Displays are the preferred choice to replace older single engine displays. These displays are enhanced by Oceanic Systems’ cutting edge BlackGlass screens, adding elegance where installed. The colour displays are sunlight readable and dimmable, making them suitable for all marine environments. “It’s not just about the cutting edge design and engine brand compatibility – fitting our Dual and Multiple Engine Displays comes down to simple economics as well. We are enabling manufacturers to save as much as £7,500 per boat in installation costs which is naturally being met very positively from our customers.” Oceanic Systems’ Managing Director Bruce Coward. 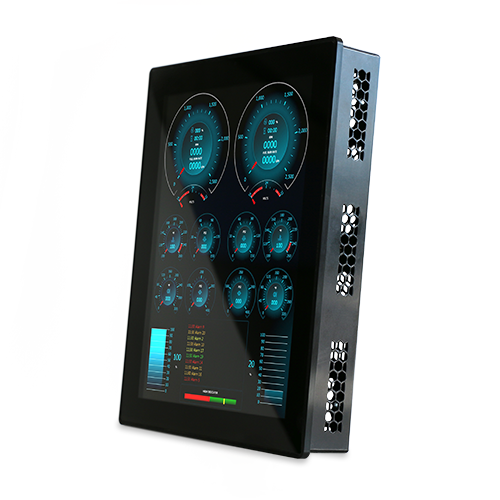 The Dual Engine display is available in the 10″ portrait model and displays data for two engines, while the Multiple Engine Display is available in 19″ letterbox wide format with the option to display data from 2, 3 or 4 engines. Both have J1939 and NMEA2000® built-in interfaces that display all the important engine data in real time. Displayed information also includes multiple tank levels, rudder/steering angle indicator, GPS compass rose and local GPS time. Oceanic Systems have sold many hundreds of Multiple and Dual Engine Displays to the world’s top motor yacht manufacturers which have been installed to complement the advanced bridge styling of modern motor and sailing vessels. Find your nearest US Representative.